The Azuchi-Momoyama period (安土桃山時代, azuchi momoyama jidai), also called Momoyama Period, came at the end of the Sengoku period (Warring States period) in Japan, when the political unification that preceded the establishment of the Tokugawa shogunate took place. It spans the years from approximately 1568 to 1603, during which time Oda Nobunaga and his successor, Toyotomi Hideyoshi, imposed order upon the chaos that had pervaded since the collapse of the Ashikaga Shogunate. The name of this period is taken from Nobunaga's castle, Azuchi Castle, in the present-day town of Azuchi, Shiga Prefecture, and Hideyoshi's castle, Momoyama Castle (also known as Fushimi Castle), in Kyoto. The period began with Oda Nobunaga's entry into Kyoto in 1568, when he led his army to the imperial capital in order to install Ashikaga Yoshiaki as the fifteenth, and ultimately final, shogun of the Ashikaga shogunate, and lasted until the coming to power of Tokugawa Ieyasu after his victory over supporters of the Toyotomi clan at the Battle of Sekigahara in 1600. In contrast to the restraint of the preceding Muromachi, or Ashikaga, period (1338–1573), the Azuchi-Momoyama period was an age of magnificence and ostentation, when the building of castles and mansions replaced the building of temples, and the rise of urban centers and a prosperous merchant class created a demand for art and culture. Hideyoshi also instituted a number of organizational and economic innovations, such as a land survey and a national census, and a "feudal system" in which vassals were ranked according to the rate of rice-production on their lands. Many of his innovations were afterwards adopted by the Tokugawa shogunate. 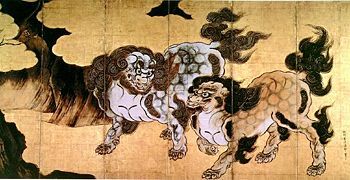 During the last half of the sixteenth century, a number different daimyo became strong enough either to manipulate the Muromachi bakufu to their own advantage or to overthrow it altogether. One attempt to overthrow the bakufu was made in 1560, by Imagawa Yoshimoto, whose march towards the capital came to an ignominious end at the hands of Oda Nobunaga in the Battle of Okehazama. In 1565, an alliance of the Matsunaga and Miyoshi clans attempted a coup by assassinating Ashikaga Yoshiteru, the thirteenth Ashikaga shogun. Internal squabbling, however, prevented them from acting swiftly to legitimatize their claim to power, and it was not until 1568 that they managed to install Yoshiteru's cousin, Ashikaga Yoshihide, as the next Shogun. Failure to enter Kyoto and gain recognition from the imperial court, however, had left the succession in doubt, and a group of bakufu retainers led by Hosokawa Fujitaka negotiated with Oda Nobunaga to gain support for Yoshiteru's younger brother, Ashikaga Yoshiaki. Nobunaga, who had prepared over a period of years for just such an opportunity by establishing an alliance with the Azai in northern Omi, and then conquering the neighboring province of Mino, now marched toward Kyoto. After routing the Rokkaku clan in southern Omi, Nobunaga forced the Matsunaga to capitulate and the Miyoshi to withdraw to Settsu. He then entered the capital, where he successfully gained recognition from the emperor for Yoshiaki, who became the fifteenth Ashikaga shogun. Nobunaga had no intention, however, of serving the Muromachi bakufu, and instead now turned his attention to tightening his grip on the Kinai region. Resistance in the form of rival daimyo, intransigent Buddhist monks, and hostile merchants was eliminated swiftly and mercilessly, and Nobunaga quickly gained a reputation as a ruthless, unrelenting adversary. In support of his political and military moves, he instituted economic reform, removing barriers to commerce by invalidating traditional monopolies held by shrines and guilds, and promoting initiative by instituting free markets known as rakuichi-rakuza. By 1573, he had destroyed the alliance of Asakura and Azai clans that threatened his northern flank, obliterated the militant Tendai Buddhists monastic center at Mount Hiei near Kyoto, and also had managed to avoid a potentially debilitating confrontation with Takeda Shingen, who had suddenly taken ill and died just as his army was on the verge of defeating the Tokugawa and invading Oda's domain on its way to Kyoto. Even after Shingen's death, there remained several daimyo powerful enough to resist Nobunaga, but none were situated close enough to Kyoto to pose a threat politically, and it appeared that unification under the Oda banner was a matter of time. During the period from 1576 to 1579, Nobunaga constructed Azuchi Castle on the shore of Lake Biwa at Azuchi (in present-day Shiga Prefecture). 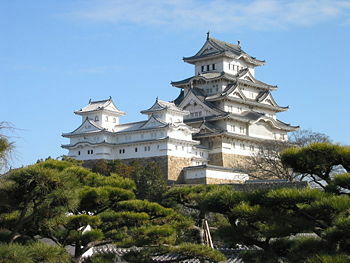 The magnificent seven-story castle was intended to serve not simply as an impregnable military fortification but also as a sumptuous residence that would stand as a symbol of unification. Having secured his grip on the Kinai region, Nobunaga was now powerful enough to assign his generals the task of subjugating the outlying provinces. Shibata Katsuie was given the task of conquering the Uesugi clan in Etchū, Takigawa Kazumasa confronted the Takeda in Kai, and Hashiba Hideyoshi was given the formidable task of facing the Mori in the Chūgoku region of western Honshū. In 1582, after a protracted campaign, Hideyoshi requested Nobunaga's help in overcoming tenacious resistance. Nobunaga, while staying over in Kyoto on his way west with only a small contingent of guards, was attacked and killed by one of his own disaffected generals, Akechi Mitsuhide. Akechi Mitsuhide sent a messenger to the Mori with a letter proposing that they form an alliance and crush Hideyoshi. This messenger was intercepted by Hideyoshi’s troops, and the plot revealed. Quickly negotiating a truce with the Mori before they could learn of Nobunaga's death, Hideyoshi now took his troops on a forced march toward Mitsuhide, covering thirty and forty kilometers per day, and defeated him at the Battle of Yamazaki, less than two weeks later. Although a commoner who had risen through the ranks from foot soldier, Hideyoshi was now in position to challenge even the most senior of the Oda clan's hereditary retainers, and proposed that Nobutada's infant son, Sanposhi (later, Hidenobu), be named heir rather than Nobunaga's adult third son, Nobutaka, whose cause had been championed by Shibata Katsuie. Having gained the support of other senior retainers, including Niwa Nagahide and Ikeda Itsuoki, Sanposhi was named heir and Hideyoshi appointed co-guardian. Continued political intrigue, however, eventually led to open confrontation. After defeating Shibata at the Battle of Shizugatake in 1583, and enduring a costly but ultimately advantageous stalemate with Tokugawa Ieyasu at the Battles of Komaki and Nagakute in 1584, Hideyoshi managed to settle the question of succession once and for all, take complete control of Kyoto, and become the undisputed ruler of the former Oda domains. He was adopted by the Fujiwara family, given the surname Toyotomi, and granted the title "Kanpaku" (Regent) representing that he was in a position of civil and military control over all Japan. By the following year, Hideyoshi had secured alliances with three of the nine major daimyo coalitions and carried the war of unification to Shikoku and Kyūshū. In 1590, at the head of an army of 200,000, Hideyoshi defeated the Hōjō, his last formidable rival in eastern Honshū. The remaining daimyo soon capitulated, and the military reunification of Japan was complete. A Portuguese Nanban carrack, 17th century. Hideyoshi now restructured the national government. Though he was in control of all Japan, day-to-day governance of the people remained decentralized. Territory was distributed to his vassals according to its capacity for rice production, measured in units called koku (one koku consisted of enough rice to feed one person for one year). A national survey instituted in 1598 assessed the national rice production at 18.5 million koku, 2 million of which was controlled directly by Hideyoshi himself. In contrast, Tokugawa Ieyasu, whom Hideyoshi had transferred to the Kanto region, held 2.5 million koku. The surveys, carried out by Hideyoshi both before and after he took the title Taiko (Retired Kampaku), have come to be known as the "Taikō surveys" (Taikō kenchi). A number of other administrative innovations were instituted to encourage commerce and stabilize society. In order to facilitate transportation, toll booths and other checkpoints along roads were largely eliminated, as were unnecessary military strongholds. Measures that effectively froze class distinctions were instituted, including the requirement that different classes live separately in different areas of a town, and the restriction of the right to carry weapons to samurai. Peasants were prohibited from carrying or owning weapons. Hideyoshi ordered the collection of weapons in a great "sword hunt" (katanagari), in which all the swords collected were melted down and made into a great statute of Buddha. 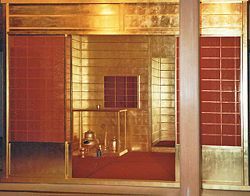 He also attempted to provide for an orderly succession by taking the title Taikō, or "retired Kanpaku," in 1591, and turned the regency over to his nephew and adopted son Toyotomi Hidetsugu. Later, he attempted to formalize the balance of power by establishing administrative bodies, including the Council of Five Eldersm who were sworn to keep peace and support the Toyotomi clan; the five-member Board of House Administrators, who handled routine policy and administrative matters; and the three-member Board of Mediators, who were charged with keeping peace between the first two boards. Hideyoshi's last major ambition was to conquer the Ming Dynasty of China, and in April 1592, he sent an army of 200,000 to invade Korea, a flourishing kingdom that enjoyed an alliance with China. During Hideyoshi's first invasion of Korea, the Japanese occupied Seoul in May 1592, and within three months reached Pyongyang together with large numbers of Korean collaborators who at first viewed them as liberators. The King of the Joseon Dynasty turned to China for military support, and the Japanese forces were forced to retreat as far south as Seoul in January, 1593. During peace talks, Hideyoshi demanded a division of Korea, free-trade status, and a Chinese princess as consort for the emperor. The Chinese saw no reason, however, to treat the invaders as equals, and peace efforts reached an impasse. A second invasion began in 1597, but was terminated abruptly when Hideyoshi died the following year. On his deathbed, Hideyoshi appointed a group of the five most powerful lords in Japan, Tokugawa, Maeda, Ukita, Uesugi, Mori, to govern as the Council of Five Regents until his infant son, Hideyori, came of age. An uneasy peace lasted until the death of the eldest statesman, Maeda Toshiie, in 1599. Soon afterward, Ishida Mitsunari accused Ieyasu of disloyalty to the Toyotomi name, precipitating a crisis that led to the Battle of Sekigahara. Generally regarded as the last major conflict of the Azuchi-Momoyama period and sengoku-jidai, Ieyasu's victory at Sekigahara marked the end of the Toyotomi reign. Three years later, Ieyasu received the title Seii Taishogun, and established the Edo bakufu, which lasted until the Meiji Restoration in 1868. The Momoyama period was characterized by the development of large urban centers and the rise of the merchant class, and by an increased interest in the outside world. The building of great castles and mansions replaced the building of temples. Masters of the Kano school decorated castles with beautiful large-scale paintings on sliding panels and folding screens. 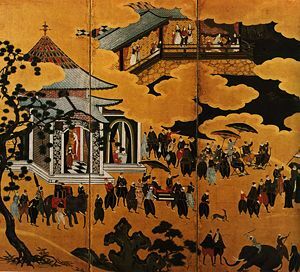 Ornate castle architecture and interiors adorned with painted screens embellished with gold leaf were a reflection of a daimyo's power but also exhibited a new aesthetic sense that marked a clear departure from the somber monotones favored during the Muromachi period. A specific genre that emerged at this time was called the Namban ("southern barbarians") style—exotic depictions of European priests, traders, and other "southern barbarians." 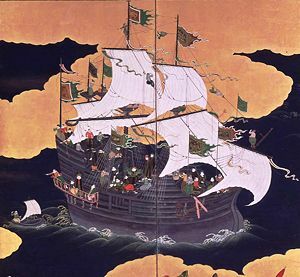 Hideyoshi had occupied Nagasaki in 1587, and thereafter sought to take control of international trade and to regulate the trade associations that had contact with the outside world through this port. Although China rebuffed his efforts to secure trade concessions, Hideyoshi commercial missions called to present-day Malaysia, the Philippines, and Thailand in “Red seal ships” were successful. Although Hideyoshi had at first welcomed Christian missionaries to Japan, he began to regard the “Kirishitan" influence as potentially subversive, so he outlawed Christianity and persecuted missionaries. Nobunaga, known for his ruthlessness, is the subject of the first; Hideyoshi, known for his resourcefulness, is the subject of the second; and Ieyasu, known for his perseverance, is the subject of the third verse. This page was last modified on 3 December 2012, at 16:46.